F - Niagara Falls. This is the Canadian Falls. 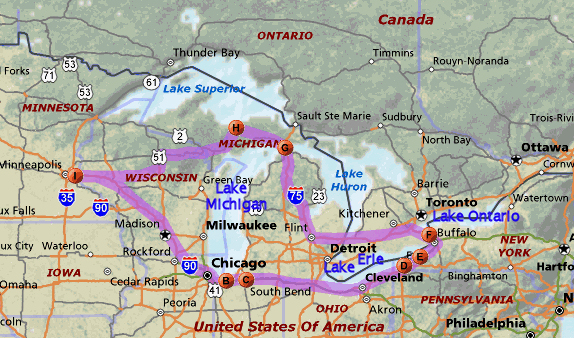 One fifth of all the fresh water in the world lies in the four Upper Great Lakes-Michigan, Huron, Superior and Erie. 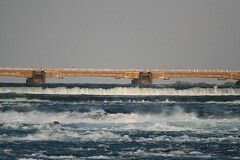 All the outflow empties into the Niagara river and 1/2 to 3/4 eventually cascades over the falls. Niagara Falls is on the Niagara river. 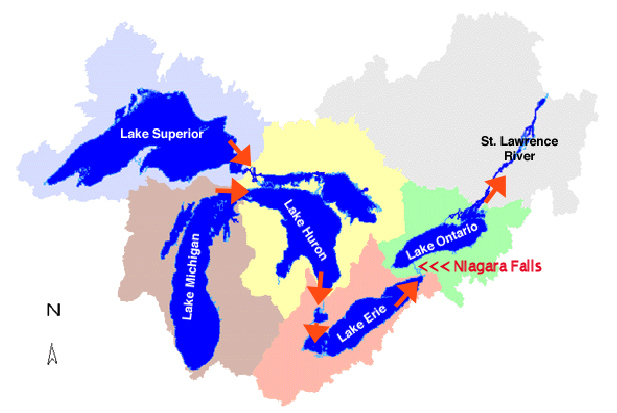 The Niagara river is the drainage outlet for the four upper Great Lakes - Superior, Michigan, Huron, and Erie. Water from these lakes drain through the Niagara river to Lake Ontario, then proceeds through the St. Lawrence river to the Atlantic Ocean. Ships bypass Niagara Falls by means of the Welland Canal. 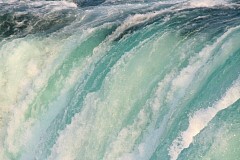 There are various theories as to the origin of the name "Niagara". It may derive from a Native American word meaning "at the neck", or may from the name of an Iroquois town called "Ongniaahra", meaning "point of land cut in two". This gives an idea of the levels and depths of the Great Lakes and associated waterways. This lists Lake Michigan and Lake Huron as a foot different in surface level, other sources report they are the same level and hence the same lake hydrologically. 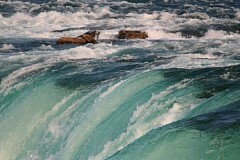 The Niagara river is only 12,000 years old. In geological time that's only a blink. Eighteen thousand years ago southern Ontario was covered by ice sheets several miles thick. As they advanced southward the ice sheets gouged out the basins of the Great Lakes. Then the Niagara Peninsula became free of the ice about 12,500 years ago. There were originally 5 spillways from Lake Erie to Lake Ontario. Eventually these were reduced to one, the original Niagara Falls, at Queenston. From here the Falls began its steady erosion southward through bedrock, The Falls moved upstream 7 miles from it's initial location at Queenston. The waterfall moved upstream (southward) for several thousand years until geological changes and re-glaciation slowed the flow in the Niagara river for the next five thousand years to ten percent of it's earliest flow. About fifty five hundred years ago glacial meltwaters were once again routed through southern Ontario, restoring the river and Falls to their full power. Then the Falls reached the Whirlpool. It was a brief and violent encounter. Lasting only weeks, perhaps even only days, in this one moment the Falls of the Niagara River intersected an old ice age riverbed. Buried and sealed during an earlier ice age. The Falls turned into this buried gorge, tore out the glacial debris that filled it, and scoured the old river bottom clean. It was probably not a falls at all now but a huge, churning rapids. When it was all over it left behind a 90-degree turn in the river we know today as the Whirlpool, and North America's largest series of standing waves we know today as the Whirlpool Rapids. Looking at the map you can see the Whirlpool labeled W and the Whirlpool Rapids which lead up to it. RB is the Rainbow Bridge. Niagara Falls is really three waterfalls. The white area on the map below the letter A are the American Falls and the Bridal Veil Falls. The white area on the map below the letter C are the Canadian Falls. Ninety percent of all the water goes over the Horseshoe Falls. 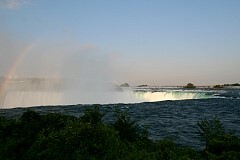 The American Falls and the Bridal Veil Falls are entirely in the U.S., the Horseshoe Falls are entirely in Canada. The area marked GI is Goat Island. 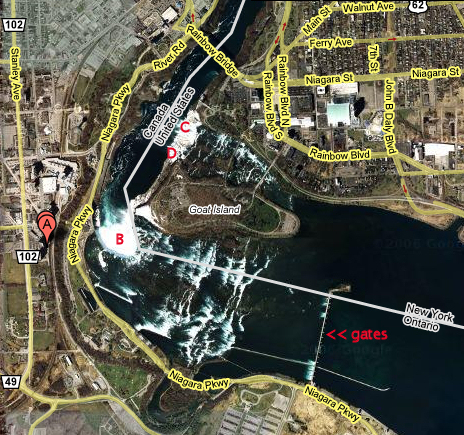 The area marked G are the gates from the Hydro Control Dam which diverts water flow from the Falls to hydroelectric plants. This diverted water is stored in a holding reservoir and many miles away released to a lower hydrological level in the electricity generating process. 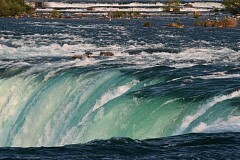 A summer time visitor to Niagara Falls now sees only half of the natural volume of the river passing over the falls. On winter days and every night the volume is reduced even more, to only one quarter of the natural volume. The Hydro Control Dam G has gates which are raised or lowered in order to increase the water flow over the Falls and to hold back the water flow for diversion into the Hydro Tunnels of Ontario Hydro and the New York State Power Authority. The dam extends 2,200 feet (670m) to the International boundary. From April to November the water level below the Falls rises an average of 3 feet each morning between 8:00 a.m. and 9:00 a.m.. 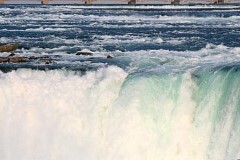 Similarly, the water drops an average of 3 feet each night between 8:00 p.m. and 9:00 p.m. At night, when Hydro Control Dam gates are lifted for diversion of Niagara River water into the hydro tunnels, the flow over the Horseshoe Falls drops to a minimum 50,000 cubic feet of water per second. The Niagara hydroelectric generating stations supply one quarter of all power used in New York State and Ontario. The gates in this shot are down. B is the Canadian Falls. D is Bridal Veil Falls. C is the American Falls. Two similar pictures of the rim of the Canadian Falls. The picture on the left has a slower shutter speed, hence the water is blurred, which to me gives an interesting flowing motion. The picture on the right has a fast shutter speed to better capture frozen motion. A more close-up still motion picture. I would love to be able to stand on the rock where the bird is standing. Enlarge this picture. I think this is a good shot - showing the power and churn and spray from the falls along with a long view up the Niagara river including the Hydro Control Dam. It gives you a sense of the vertical drop in the river prior to plunging over the falls. Enlarge this picture. 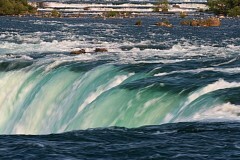 It's the flat view of water plunging over the Canadian Horseshoe Falls. It gives a faithful representation of the mist generated by the falls and even shows a slight rainbow on the left. When you stand and view the falls by the Table Rock Center prepare to be lightly coated by mist.